Other notable guests in attendance included Rupert Murdoch, Louis Vuitton's Bernard Arnault, U.S. Olympic athletes and former Secretary of State Henry Kissinger. Trump and First Lady Melania opted to keep the first state dinner small, not a gala affair seen during Obama's presidency. This makes it all the more noteworthy that Cook and Jackson were in attendance. Trump and Cook originally met shortly after the election at Trump's tech summit, which invited a number of high-profile tech personalities to discuss pressing issues related to trade, cybersecurity and more. Cook was also rumored to have joined the president's Office of American Innovation, something he later denied. The two have had a bit of a storied history, with Trump calling for a boycott of Apple products during his presidential campaign. As president, he praised Apple's investments in the U.S. and personally thanked Cook for the company's financial contributions. Cook has been critical of Trump's policies, and last year denounced the president's DACA repeal. The Apple chief has also touched on Trump's tax policy, saying that while he doesn't necessarily agree with the individual mandates, he credits reform to the corporate tax policy as a catalyst for Apple's repatriation of its offshore cash hoard. Jackson is no stranger to the Washington, D.C., social scene, having previously served as the head of the Environmental Protection Agency under President Obama. At Apple, Jackson not only serves as head of the company's environmental initiatives, but also plays a key role in government affairs. 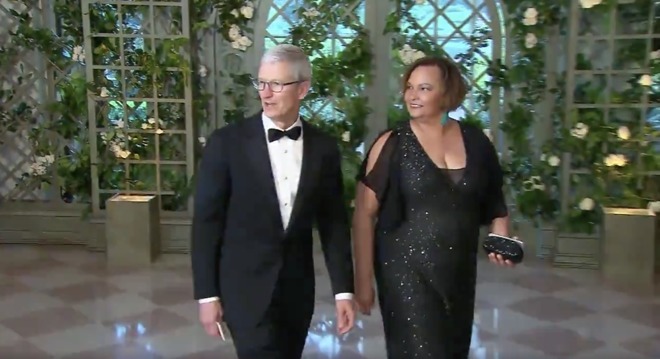 Tonight's dinner marks the second White House appearance for Cook and Jackson, who paired up to attend Obama's state dinner in 2015.